Yesterday's post featured the Globetrotters... today's post will feature some trottin' around the globe. This blog is so worldly and phenomenally cultured. Players from camps across Florida and Arizona are packing there bags and getting out of town. No, the first spring cuts haven't been made yet - tomorrow, the World Baseball Classic will officially be kicking off and stars from around the world will be playing for national pride. Baseball's answer to the elimination of the pastoral pastime from Olympic competition will open up with Team Israel taking on Team Korea in the Pool A opener at the Gocheok Sky Dome, overseas. Of interest to me, former Cub Jason Marquis will be taking the mound for Israel at 4:30 AM ET. Talk about an early start. 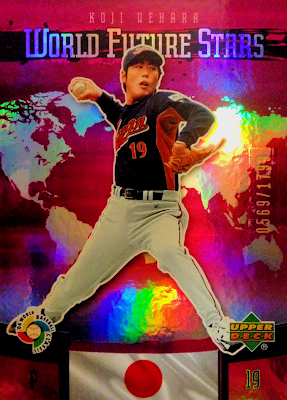 The Cubs' recently-signed, late-inning reliever Koji Uehara participated in the inaugural edition of the World Baseball classic for his native Japan in 2006, a few years before making his way over to the MLB. The then-Yomiuri Giants star recorded two wins and led all hurlers in the tournament with 16 K's, along the way, helping to lead Japan to the WBC crown. It seems likely that this performance put him on the MLB radar for his eventual posting in 2008. 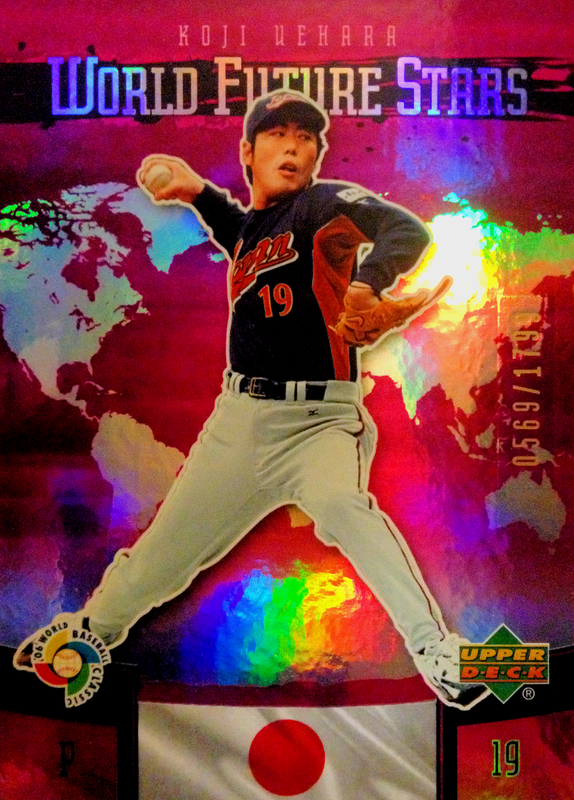 For his impressive showing, Koji was honored with the above, super-shiny insert in Upper Deck's 2006 World Baseball Classic box set. It's numbered to 1,799 (random) and is, by far, my nicest Uehara card. Although, until a couple of days ago, I didn't even know that I had it. 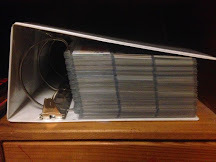 A couple of summers ago, in the early days of this here blog, I made a sly purchase of a 3,200 count box of random baseball cards at a local garage sale for a few bucks. There were all sorts of odd and satisfactory finds contained within that fit into my collection; however the vast majority went into my trade stocks, which are sorted by teams. This Uehara, with it's lack of MLB team association, ended up kicked to the side with the miscellaneous stuff and was promptly forgotten. It wasn't until a couple weeks ago, when I was doing some early spring baseball card cleaning, that I rediscovered this bundle of foily goodness. Even better, by this point, the Cubs had inked the rubber-armed reliever to a one-year deal, meaning that this special insert now "inserted" perfectly into my collection. Score! Javier Baez and Hector Rondon are the only two current Cubs competing in the tourney this spring. 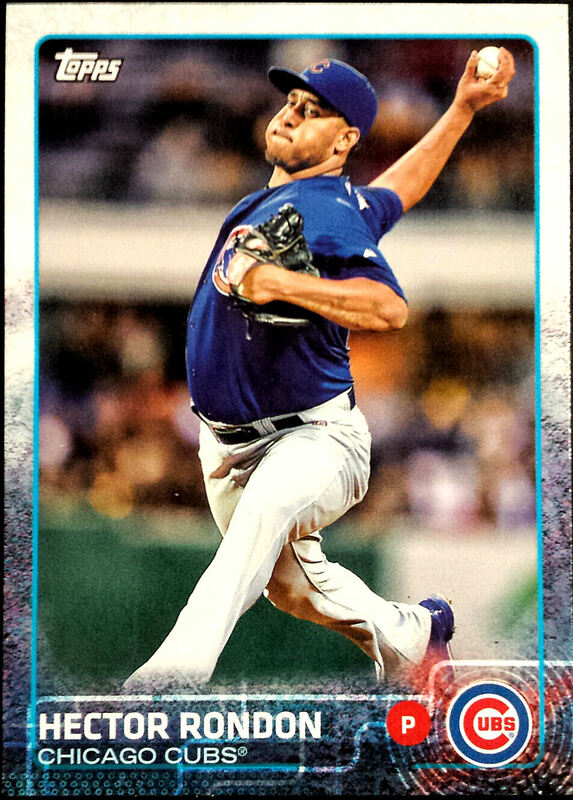 It's always a pleasant surprise to add a new card to the old collection without having to drop so much as a dime. Maybe I should do some "spring cleaning" every season. Back on the subject of the World Baseball Classic, I'm going to be doing my best to make sure that I catch as many games as possible. This curiosity stems largely from my desire to see how current Cubs like Javy Baez and Hector Rondon fair for team Puerto Rico and Venezuela, respectively, and to see how former Cubs Marquis and Ryan Dempster (Canada) do in their comeback attempts. However, due to declining ratings and lack of interest, this may very well be the last edition of the World Baseball Classic. I think that international competition should always have a place at the baseball table; thus, I will be doing my part to boost interest in the spectacle. So, on that note, despite this post making mention of Israel, Korea, Japan, Canada, Puerto Rico and Venezuela, go Team USA! I guess you're currently my only source for this kind of news. I had no idea about Marquis and Dempster. I do recall Ryan being kind of vague about his plans when he quit playing. 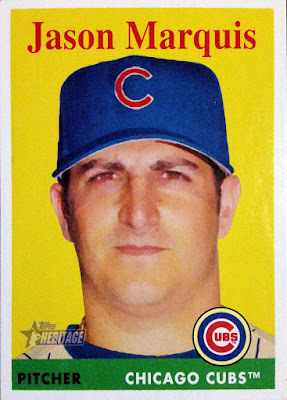 He was my favorite of the Piniella era Cubs. I love the World Baseball Classic. Just wish that Team USA would find a way to get its mega stars on the team. Would be so much fun if Harper and Trout would play. Not only is Jason Marquis pitching, I think he has a shut out. I remember him as a Cardinal, they used to turn off the radar gun when he pitched. The harder he threw the straighter his pitches went.